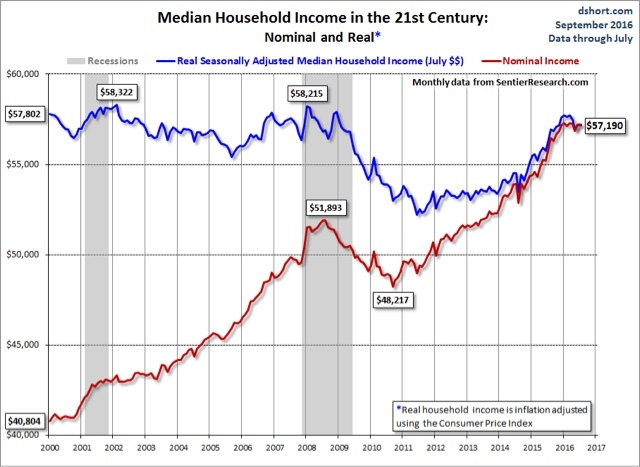 In April of this year, I wrote a piece entitled "Would the real real median household income please stand up?" discussing three separate measures from the Census Bureau, the BLS, and private think tank Sentier Research. household income in the United States was $56,516 in 2015, an increase in real terms of 5.2 percent from the 2014 median of $53,718. 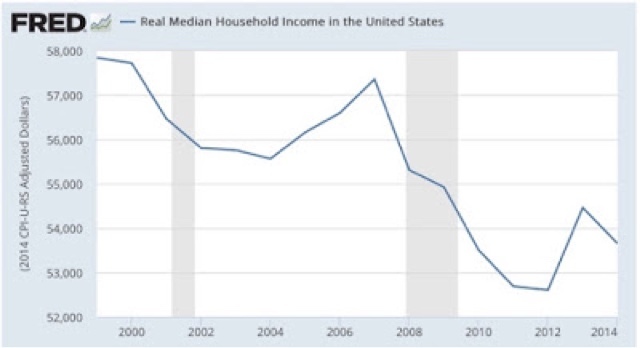 This is the first annual increase in median household income since 2007, the year before the most recent recession. The problem is, this report is so tardy as to already be outdated. After all, it is only issued once a year, so we just learned about the 2015 average -- but we are already only 3 1/2 months away from 2017! 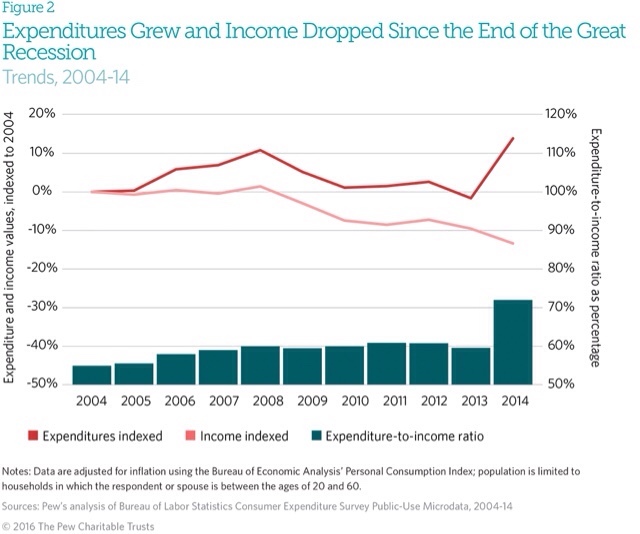 But there is a third source of information as to real median household incomes: Sentier Research, a private facility where two former Census Bureau researchers compile a monthly update from the Household Survey (the source of statistics like the unemployment rate and the employment to population ratio in the monthly jobs report). With only a one month delay, Sentier was already showing a huge increase in median household incomes in late 2014 continuing in 2015. Nearly one full year later, the official number showed what Sentier was reporting in nearly real time. Yesterday's Census Bureau report was a major validation for the credibility and reliability of Sentier's monthly update. 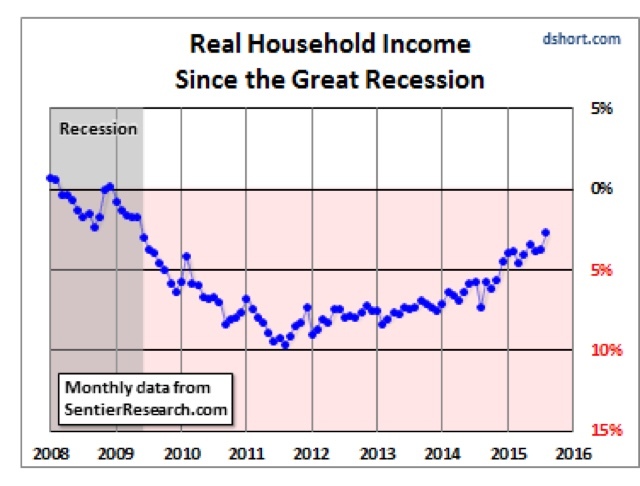 Real median household income is higher still in 2016 than it was in 2015, but in the last several months it has stumbled. One year from now, that is probably about what the Census Bureau will tell us. this is too important a statistic to leave to very delayed and problematic annual measures. An even more complete measure, average per capita adjusted gross income - which is generated from the complete tally of all tax returns filed in any given year, is only available through 2013! Resources should be devoted to producing more accurate and timely measures on a Quarterly basis at least.